I have always thought that if I had more time, money and bookshelves (a not uncommon complaint among book collectors! ), it would be both fun and enlightening to try and collect as many titles as I could that were printed under fictitious imprints. Publishers have for centuries sought to escape secular and ecclesiastical censorship by producing titles that sport a fake publisher’s name and often a fake place of printing (and/or a fake author) as well. One of the best known of these fictitious imprints, Pierre (du) Marteau of Cologne, was widely used by Dutch and other publishers during the 17th-18th centuries to avoid prosecution for printing pirated editions, sensitive political tomes, satires, anti-clerical works and the like. The Philadelphia Rare Books & Manuscripts Co. lists just such a title on their website. Printed in 1686, this title (depicted above left) is a very early example of the Marteau imprint, the first known use of which was by Jean Elzevier in Leiden in 1660. PRBM notes that this title was written by a Huguenot minister and theologian who fled France after the revocation of the Edict of Nantes, a typical reason for using a fictitious imprint. Of course, so many titles have been published under fictitious imprints over the centuries that I probably need to specialize so as not to run out of time, money and bookshelves too quickly. One area of specialization that is particularly appealing is auction catalogs with fictitious imprints. The set of catalogs depicted left was produced during the Anglo-Dutch Sea Wars of 1780-1784. 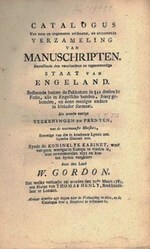 Currently listed at Antiquariaat Forum, this collection of pamphlets takes the form of ... fake auction catalogue[s] ... containing fake lots with manuscripts, books, prints, drawings & paintings, furniture, artefacts etc...... Each supposed lot contains a description with satyrical comments on the English monarchy and nobility. Publishers have for centuries sought to escape secular and ecclesiastical censorship by producing titles that sport a fake publisher's name and often a fake place of printing (and/or a fake author) as well. One of the best known of these fictitious imprints, Pierre (du) Marteau of Cologne, was widely used by Dutch and other publishers during the 17th-18th centuries to avoid prosecution for printing pirated editions, sensitive political tomes, satires, anti-clerical works and the like.